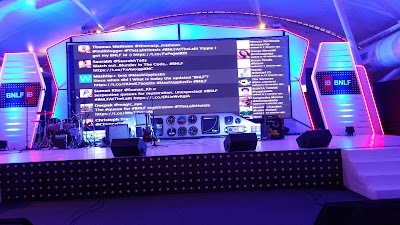 #BNLF I've learned means Blog Now, Live Forever. Pretty cool I thought! This weekend—31st Oct and 1st November -- was spent at the #BNLF conference held at The Lalit, Mumbai. Intrigued by the name and impressed by the lineup of speakers consisting of people like Purba Ray of the A-Musing fame (I have always been intrigued by that hyphen), Arnab Ray, the author of May I Hebb Your Attention Pliss, better known as the @greatbong, Anshul Tiwari, Founder and Editor-in-Chief of Youth ki Awaaz, Christoph Trappe, the writer of The Authentic Storytelling Project blog, Jeff Bullas whose blog I have been following from years, Preeti Shenoy and none other than Bruce Dickinson of Iron Maiden – decided how I would spend my weekend. This post is a summary of my impression of Day 1. 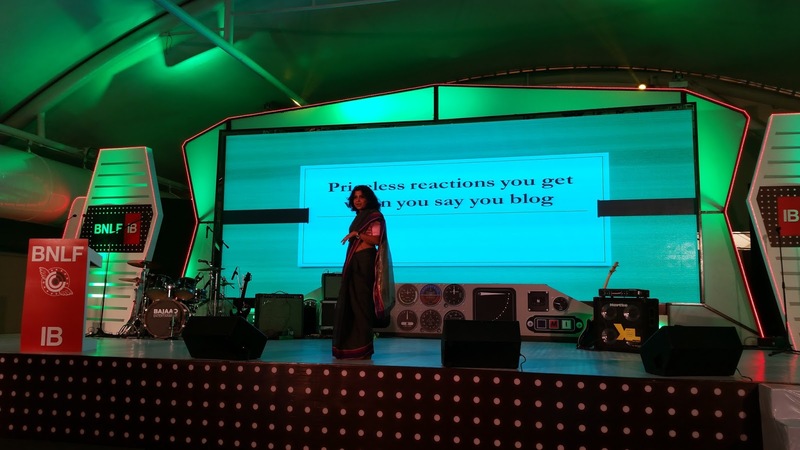 This was my first BNLF, and I wasn’t quite sure what to expect from the blogging fraternity. I had somehow assumed that a hundred odd people would turn up and most would be fans of writers like Arnab Ray and Purba Ray… . 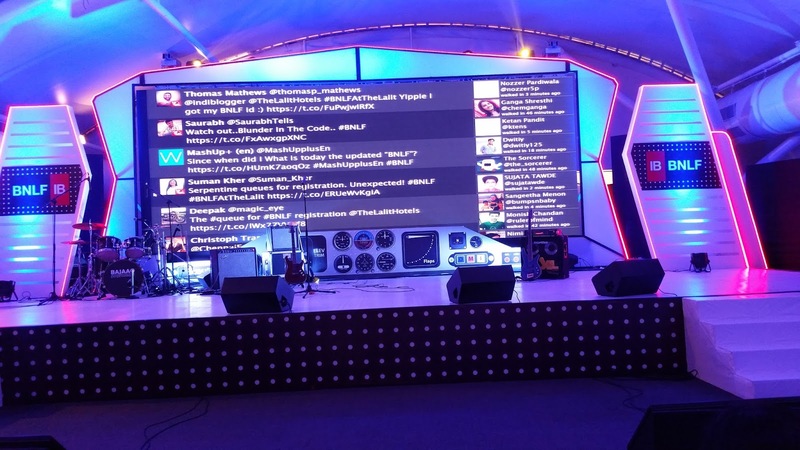 I turned up at The Lalit well-ahead of time as I’m wont to do, and was ready to meander in the lobby when I encountered at least 300+ people generally hanging around – some in clusters, some alone and some evidently #BNLF organizers wearing the hashtag T-shirt. Hmm! Not quite what I had envisaged for sure. Within a span of 15~20 mins, the 300 swelled to 500+ with more coming. And registration was yet to start. I learned that this amorphous bunch of people consisted of #BNLF regulars as well as the uninitiated like me. “Welcome to the tribe,” someone said. “Are you’ll all bloggers,” I asked? “Yes, of course,” was the somewhat astonished response. That shut me up for sure! There were bloggers from all over India—from Delhi, Chandigarh, Pune, Kolkata, Banglaore… There were bloggers writing on every kind of topic imaginable—from gardening to lifestyle, urban yoga to urban homes, from quilling to political spoofs – if you can think of a topic, there was probably a blogger there writing on it. There were bloggers ranging from 21 year olds to folks in their 50’s. I couldn’t have been more mistaken in my assumptions. And everyone had come to learn, to improve their blogging skills, to pick-up techniques and methodologies to take their blogging to the next level. I was impressed and a little bit awed. 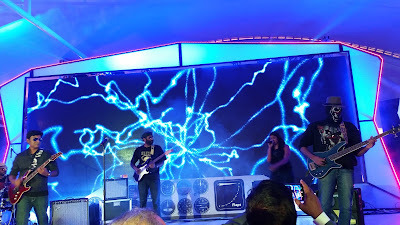 Being used to conferences like #SHRM, #HRTech, and other corporate affairs, I was in for another dose of shock when we entered the main venue post registration. It looked nothing like a conference room. It resembled a rock-show arena with a brightly lit, kaleidoscopic stage, laser lights doing their thing and various musical instruments (I don’t know all the names so won’t get into the details) casually strewn about. The long hall held rows and rows and rows of white chairs – at least a 1000 it seemed -- and looked somewhat surreal to me. I quickly grabbed one in the first row and settled down. The day began with rock music—yes! no corporate affair this one! 700+ people were on their feet rocking and swaying and clapping to “We don’t need no Education” and other favorites. What a start! The day maintained the momentum and the speakers didn’t let us down either. Each had their unique story and perspectives to share. I’ve made a holistic list of my key takeaways from the day that I felt would be worth sharing for other bloggers like me. Bring Constancy and Commitment: This theme cropped up in everyone’s talk and the masterclasses that followed on Sunday. More about these in my next post. Without exception everyone spoke about being committed and regular with one’s blogging schedule, to post on a specific day of the week, and even at a specific time. The trick is to have a set of posts ready and scheduled to publish. This not only helps loyal readers keep track of your writing but also helps in search engine rankings. While I theoretically knew all this, I had not gotten around to being this disciplined. Coming from some of the most respected bloggers and writers, it was a hard-hitting message for me. Keep it Conversational: Apparently, while we all like to sound erudite and believe that obfuscating points make them more interesting, it is not true. I pondered a while and realized that the blogs I like in my domain are all written in the simplest language without any loss of depth or impact. The first example that came to my mind was @AbhijitBhaduri ‘s blog! So, keeping it simple, using short words, and writing as if we were explaining a concept to a friend is a good approach to follow. Make it Authentic: In their various ways, each of the speakers emphasized this with Christoph Trappe making it the core of his piece. Of course to be authentic, it is essential to feel deeply and passionately about our domain of blogging. It is impossible to be authentic without being passionate. It also implies being vulnerable and open, considering readers as friends. A stilted and fake voice will neither get us loyal readers nor make us feel satisfied with our writing. Re-purpose Content: I often forget that I can use my blog post to create a SlideShare presentation, craft unique tweets or use the images for Pinterest boards. Re-purposing content across different social media channels in different forms not only ensures a wider and more constant reach but also addresses varied audience preferences and needs. Keep an Eye on the Headline: According to research, listicles are a great way to get attention for primarily three reasons -- 1) provide a container around content pieces; 2) make it easy for the readers to keep track, and go back and forth; and 3) make it easy to recall. While definitely not all my posts can have a title beginning “7 ways to…” and “9 things to keep in mind…”, it is an advice worth remembering. Headlines are very critical, especially in this era of content abundance and attention deficit. Headlines should clearly tell readers what they can expect from the post. Remember the 60-30-10 Rule: This specifically struck a chord with me. Christoph Trappe mentioned that successful blogging is defined by this rule of time and effort breakup – where 60% is devoted to creating authentic and original content; 30% should be given to listening and conversation because blogging is not a siloed activity; and 10% effort can be spent on sharing and linking on different social platforms. This is a good rule of thumb I intend to practice more consciously. Don’t be Over-Dependent on Social Media: Jeff Bullas emphasized the importance of focusing on search and doing keyword research for those serious about growing their readership. Good content is of course a must and a given. According to him, the power of headlines, images and email lists should not be ignored. I’m going to explore these one at a time and test for impact. All in all, Day 1 gave me plenty of food for thought and action. I know consistency is going to be my key issue, with procrastination my Achilles’ heel. Look out for posts on the Day 2 Workshops and other unique moments. Thank you for visiting my blog and for taking the time to post your thoughts.